Dave Harrison has been with the Wolves since their inception. 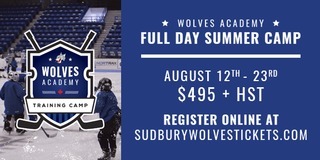 When Sudbury joined the Ontario Hockey Association (now the OHL) in 1972, he was brought in by part-owner Joe Drago to serve as the club’s statistician. 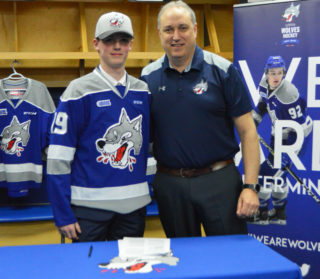 The pair knew each other from their days growing up in Espanola, and Harrison, who had helped the Northern Ontario Hockey Association track its statistics for ten years, was the ideal candidate to help the Wolves organize their numbers for their inaugural season. 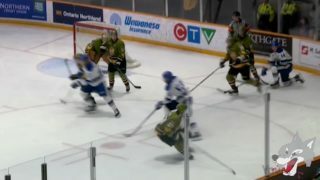 “Drago wanted me to look after things for the first year and get things line and then he probably thought he would be able to find somebody in Sudbury. Well, 47 years later he hasn’t found anybody,” Harrison chuckled. Over the near half-century that Harrison has faithfully served the club, he’s seen the changes to how statistics are tracked in hockey. Today, Harrison receives an electronic copy of the scoresheet usually within ten minutes after the final buzzer, but before the digital age, he had to wait for it to arrive by mail. “It was a problem with away games because you had to wait for the home team to come home and then mail them to you. The home team in the game didn’t mail out to the other league’s statisticians, it was a jumbled up mess, let’s put it that way,” Harrison recalled. Once Harrison retrieved the scoresheet from his mailbox, he dutifully went about his task, tracking and tabulating the numbers by hand with pen and paper. Computers have made Harrison’s job easier, but there isn’t any less work. If anything, there’s more. “It’s more analytical now. When I started, there wasn’t much to keep, but it has evolved. It takes me about two-and-a-half hours now to do one scoresheet from a Wolves game. Even with pen and paper and no printers, it didn’t take me that long,” Harrison described. During his time with the club, Harrison has documented some incredible feats, including Rod Schutt’s 72-goal campaign and Mike Foligno’s 150-point season, but the one accomplishment that still impresses him the most after all these years is Bobby Chaumont’s ironman streak. “I think it’s a record that will not be broken,” Harrison surmised. “He came into the league in 2001 and played four years and 24 playoff games without missing a game. 296 games. I look at these guys now and if there’s anybody who plays the full season it’s a surprise. That somebody could go that long. He must have hurt some time, if he didn’t, I want his genes,” Harrison laughed. Harrison may not have Chaumont’s genetics, but he certainly has his longevity. When Harrison first joined the Wolves in 1972, he was 34 years old and working for the Espanola Board of Education. Forty-seven years later, he’s approaching his 81st birthday and has been retired for more than two decades. What hasn’t changed is his passion for hockey and his love of numbers. 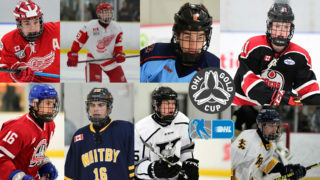 In addition to his duties with the Wolves, Harrison also does statistics for all twelve teams in the Northern Ontario Junior Hockey League. “I spend about four hours a day doing stats on the computer because I keep my own complete set of stats and compare that with the league stats,” Harrison noted. Next year, however, it will be a different story. 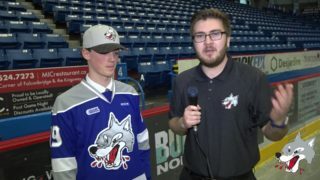 Harrison will have much more time on his hands, as the 2018-19 campaign marks his final season as the Wolves statistician. “I’ve just decided it’s time to get out. I think it’s time to relax a little bit,” he reflected. Harrison’s wife, Antoinette (Tony), will certainly welcome the change of pace. “My wife might be happy that we might be able to go away for a weekend. She’s put up with it the full length. Not going away to see the kids or not taking a holiday during the winter because it just doesn’t work with the season,” he explained. Although Harrison has put in a lot of hours over the years, he has fond memories of spending time at the rink with his wife “Back in the old days, my wife and I used to go to the games and we’d get home from the Sudbury Arena around two o’clock in the morning. Not because the hockey game was that long but because we were sitting around with the owners and coaches in the press room,” he recollected. Even if it was just to shoot the breeze with the coaches and ownership group, Harrison relished those moments in the arena following a game. Harrison may be counting down the days to his retirement, but he’s hoping his services will be required late into the spring. “If they stay in the top four and they get the extra home game in the first round, I expect them to go a long way and I expect it to be exciting,” Harrison suggested. “If their power play, which is almost non-existent, starts to click they’re going to go a long way,” he continued. No statistic can measure Dave Harrison’s contributions to the Wolves. There are very few people who know as much about the team, and even fewer who have done as much for the club as he has. 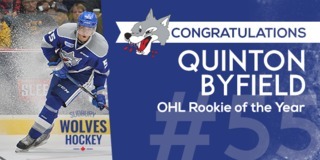 While his name may not be etched into the Wolves’ record books, his commitment and service to the team will be a legacy that will likely never be surpassed. 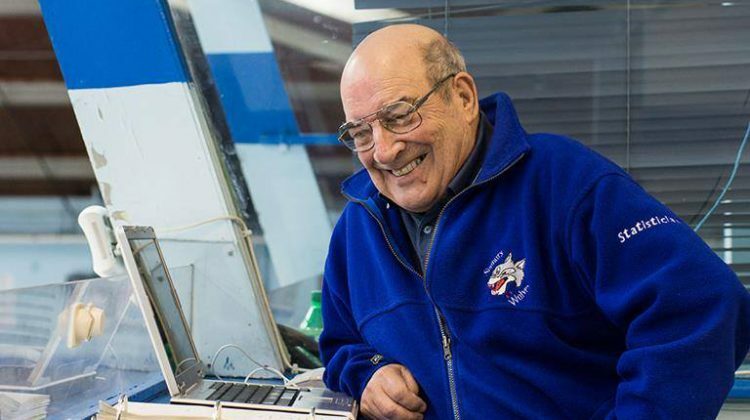 The Wolves honoured Dave Harrison’s long-time service to the club on March 2nd when they hosted the Oshawa Generals at the Sudbury Community Arena.